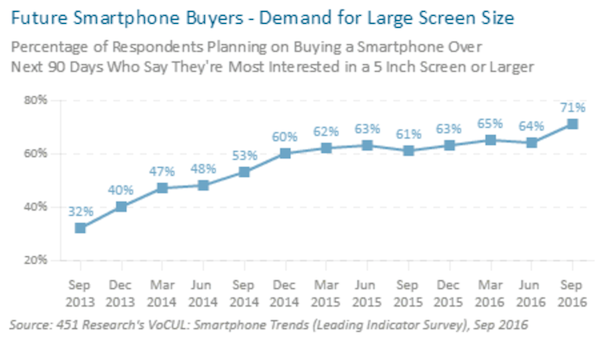 451 Research recently surveyed planned smartphone buyers and found the demand for large-screen devices has reached a new high, with 71% saying they prefer a 5-inch screen or larger (i.e., a phablet) - up 7 points from previously. 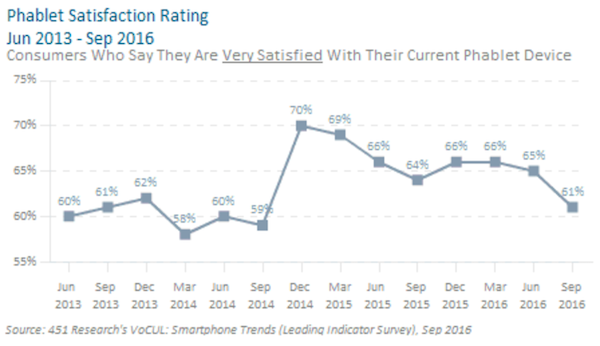 When it comes to satisfaction among phablet owners, 61% report they're Very Satisfied with their device. However, this is down 4 points from June. To receive more articles like this, join the 451 Global Digital Infrastructure Alliance. The 451 Alliance is a member-driven 'think tank' comprised of a worldwide network of highly-qualified enterprise technology and IT professionals. The Alliance tracks changes in corporate IT and digital infrastructure technologies well in advance of other sources and reports findings directly to its members. Thanks to our partnership we are able to offer our members a complimentary membership. Membership includes access to 451 Alliance's weekly research reports and a bi-weekly newsletters.Join now!